Our Client Services Representatives work with business owners, managers, and staff in a very wide variety of business categories. Our staff is professional, but casual, and trained to ask questions that allow us to capture the needs of your new website. To see what we can do for you we share a few of the most recent, with some old favorites mixed in. We worked with Tabor to create an online inventory system. Customers can browse the available inventory from the comfort of their own homes. We helped build a page that would explain Tabor's financing experience and answer any questions their customers might have. Tabor now has the ability to easily update their online inventory to keep their customers in touch with what they have to offer. 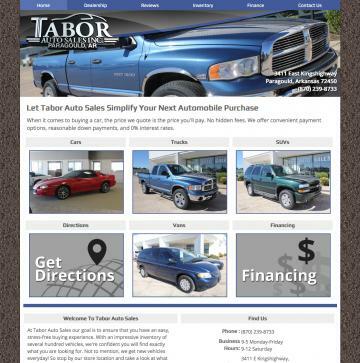 Tabor can now put faces behind names with a page all about their dealership, staff and more. Adams' wanted the website to reflect the personality of their business and provide the same friendly feeling customers get when they visit their store. To add personality the website, a blog was included, a flowery photo gallery and Adams' social interaction on Facebook was added to their home page. Content was written to reflect the voice of the business owner or staff. 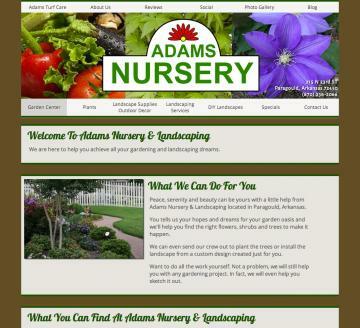 Adams Nursery makes use of our easy image uploader and text editor to showcase their advertising specials for the season. Quick Photo Galleries allow them to show off their best blooms. A creative use of subpages allows them to present information to visitors both efficiently and effectively. We worked together with the business owners to gather the information and photos needed to create an online business brochure. With this, we customized the navigation so that visitors find information easily--which became a valuable tool for their sales department, as well. When the site was completed, the owners were trained to make changes and add content so that their site can be changed as quickly as needed. With an online product catalog, J + W Distributors is easily able to reach potential buyers faster and easier than ever before. 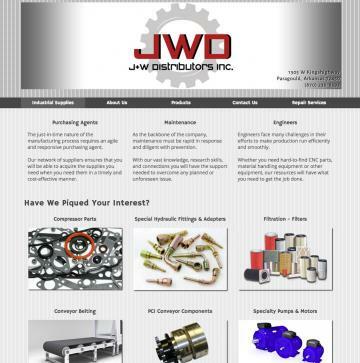 Having an online Quote Request form makes J + W open to their customers 24/7. By offering comprehensive product information, J + W are inviting buyers and search engines alike to take a look at their content. They needed a blank canvas where they could post coming events, create photo galleries of each performance, let the public learn about their youth programs, share their latest news, and allow their fans to see their (always busy) Facebook feed. In short, they wanted to create a centralized hub to showcase every thing the DSO brings to the Northeast Arkansas Delta. And they wanted to build it from the ground up. Photos can easily be placed anywhere on the site. DSO adds advertising from their upcoming events to their home page. DSO used the embed feature to add their Paypal Donations button to attract donations from their website. 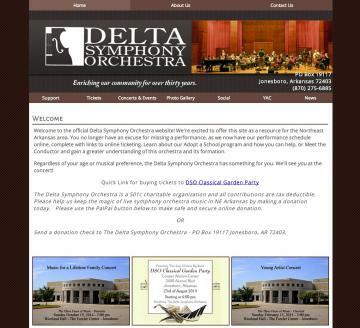 DSO uses the subpage feature to make each of their upcoming events easy to find on their website.